Well, I can't believe it has been seven years. Seven has always been a significant number, this year the significance will not be one of luck but of destiny. This past year Polly, Bob's mother, embarked upon her final flight to join him. The family has asked us to spread her ashes at Kahana where they will be reunited with her son's. Bob's sisters, nieces and nephews from the mainland and Maui will be joining us for this celebration. We will be camping and partying all weekend long. 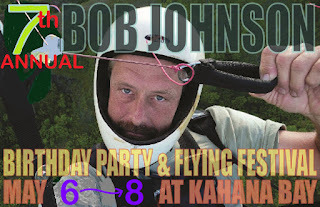 As usual all are invited and strongly encouraged to be there for this fly-in to honor Bob's and Polly's Birthdays. Details to follow in the Comments section below. I may not be camping. But I will be bringing the hot water shower and the sink. But I do not have the gas canister anymore. So if you want hot shower some one will have to bring gas. I'll bring a full propane tank. Sidehill: How many do you normally use for the weekend? Hope you continue mending well. Thanks, Thom! I'll also bring a propane tank. two tanks should be enough. So far, campsites 1 thru 6 have been reserved by HPA members, all others are open saturday/sunday (7 & 10 are reserved for friday only as of 04/09). All pilots, family members and friends are welcome to stay on the LZ side of the river and share any of the campsites. If you have a preference, please let us know. This year we will be even more lay back then previous years and not plan on big meals to share with everybody, so be prepared and bring your own (even though we might have some to share). Please be courteous and don't raid other people's coolers (sounds obvious but it happens every year). Most people forget, but it is important to bring your own water to drink as well. Place recyclables outside and near a trash can (so people don't have to go inside the trash cans for the valuable HI5 deposits). it is going to be great and I am looking forward to it! Aloha, How do I sign up for a camping spot? Could someone please contact me? Thanks--Wendy Gibson wendygibson9@gmail.com (808) 321-4503. The Johnson family will be with us on SUNDAY , the 8th for spreading of the ashes. For the first time in 7 years of this event we were not able to spread our wings and fly (safely). Rain and lots of more rain pushed a few brave souls who tried to stick out despite of the forecast to rush back to their homes. Among those were Ginny, Geronimo and Sandy, Tommy RD and Serena, Kevin, my brother Fabio and myself with our respective families. Friday we set up camp while Alex and Duck showed up from a downwinder with their SUPs. we talked story, had a few refreshments and later on BBQ. It looked like the rain was going to stop and a beautiful starry sky opened up to fool us before a major downpour. Saturday morning started dry and playing with the kids at the beach was a lot of fun! The river was raging fast and eroding the roots of the trees close to the bathroom, so we jumped into action and diverted it away before trees could lean and block some of our landing approach. With light rain bothering campers the rest of the day, slowly people started heading home. I just left the campgrounds without breaking it down in hope it would get better sunday/monday but the later forecast update wasn't looking very good. On sunday we returned to break camp and wait for the Johnson family, who was joined by close friends and together with the support from Kahana canoe club we went on 2 6 man canoes to spread the ashes of Momma Polly Johnson, Robyn's husband and Camille's father. It was a moving ceremony. We later gathered to bbq and say our goodbyes and left a wet and rainy Kahana in good spirits.